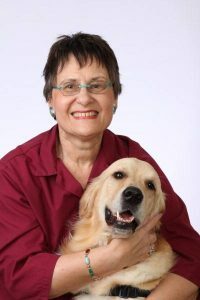 Sandy Pobanz and her dog Teddy participate in Mayo Clinic Caring Canines Therapy Dog Program on Mayo Clinic's Arizona campuses in Scottsdale and Phoenix, providing a special brand of comfort to patients. Sandy Pobanz knows Mayo Clinic’s campus in Arizona very well. She volunteers with the Mayo Clinic Caring Canines Therapy Dog Program with her English golden retrievers, Benji and Teddy. They provide a special brand of comfort to patients in the Outpatient Radiation Oncology waiting area on Mayo Clinic’s Arizona campus in Scottsdale and Mayo Clinic Cancer Center, Radiation and Proton Beam, on the Mayo Clinic’s Arizona campus in Phoenix with pediatric cancer patients. But recently she stepped onto the other side of the desk as a patient eager to learn about genomics and unlock the mysteries of her own genetic makeup. She participated in the April 2017 Understand Your Genome Symposium in Phoenix, an event co-sponsored by Mayo Clinic Center for Individualized Medicine and Illumina. Ms. Pobanz joined nearly 90 other individuals who took a deep look at health and risk of disease by having their DNA sequenced. “I seized the opportunity to attend the symposium to learn about genomics and its application to individualized and precision medicine. First, as a benefactor supporting medical research at Mayo, I was very curious to learn how genomics is used to understand health issues for the broader population. Second, I wanted to learn what genomics could reveal about my own health,” explains Ms. Pobanz. Before attending the symposium, Ms. Pobanz knew the importance of receiving the correct diagnosis and appropriate treatment — her mother's and father’s stories served as perfect examples. In 1942, Sandy’s father, Wilbur Pobanz, sought care at Mayo Clinic for a heart condition, which had left him unable to work for two years. Mayo physicians diagnosed him with acute tachycardia and identified appropriate medication. He recovered and thrived, living to 95. In 1998, her mother, Grace Pobanz, was diagnosed with non-Hodgkin’s lymphoma and was treated at Mayo Clinic. With her parents’ stories in mind, Ms. Pobanz was anxious to hear symposium experts discuss how genomics further enhances a physician’s ability to diagnose and treat – even prevent disease. “Even though my test results did not point to any predisposition for disease, I now understand what a powerful tool genomics is for guiding individualized medicine. Every week as a Mayo volunteer, I visit with cancer patients who are undergoing radiation and/or chemotherapy treatment. I see how identifying the right treatment for each patient can help them live longer, quality lives,” says Ms. Pobanz. For Ms. Pobanz, the most important finding about her own health came from the genetic report on how her body responds to medications – known as pharmacogenomics. “I never realized how a person’s genes can impact what medications will work best for them. My test results revealed that I am very sensitive to Warfarin, a medication used to prevent blood clots from forming. Without this knowledge, I could have taken this medication at the normal dose and potentially suffered serious side effects,” she says. Based on these results, Ms. Pobanz chose to undergo further pharmacogenomics testing at Mayo Clinic. The tests confirmed the initial findings and also revealed new information about her health. First, she discovered that she needed to reduce the amount of Ibuprofen she was taking to manage osteo-arthritis pain in order to avoid potential harmful side effects on her heart and stomach. She also discovered that she rapidly processes caffeine and now limits how much caffeine she consumes. She further discovered that the other prescription medications that she takes are appropriate to her genetic makeup. “These results changed some of my daily habits. I never thought that such cutting edge technology would impact my own medical care. Genomic testing can clearly play a crucial role in improving care for patients,” says Ms. Pobanz. While some patients may not wish to know their genetic test results, Ms. Pobanz did not have any hesitation about receiving her test results. But, she does have a few ethical concerns, namely, “I recognize that genetic testing can help people determine whether they are a carrier for a particular genetic condition and then use that information for family planning. For me, the downside of this technology is using it to test embryos, allowing parents to select the healthiest ones to bring to term. This goes against my personal beliefs. Using genomics to select an embryo or abort a child troubles me greatly,” explains Ms. Pobanz. Understand whether your genetic makeup could impact the way your body responds to specific medications. These findings explain why some medications do not seem to work well and why others may potentially cause harmful side effects. Genetic counseling before testing: Genetic counselors review your personal and family medical history, explain testing options and discuss pros and cons of genetic testing. For example, they may help you explore whether you want to know if you are at risk for developing conditions for which there is limited treatment or no cure. Being at risk does not necessarily mean you would get the disease. But having the predisposition would definitely assist your physician when applying precision medicine as you age. Blood test to obtain DNA for genomic testing: You are asked to provide a blood sample for DNA testing. Follow up genetic counseling session after testing: Genetic counselors help you understand how any genetic variants found may impact your health. They explain how results may impact your future health care decisions, such as suggestions for additional screening or preventive measures if results show that you are more likely to develop a certain disease. In addition to being a dedicated volunteer and longtime patient at Mayo Clinic, Ms. Pobanz and her family are benefactors, supporting future research scientists through the Wilbur T. and Grace C. Pobanz Endowed Predoctoral Fellowship for students in Mayo Clinic Graduate School of Biomedical Sciences. The fellowship was the first of its kind dedicated solely to the training of research scientists in the school’s Ph.D. program. “I have been very involved with the Pobanz scholarship recipients, many who are using genomics in their research. I was fascinated and inspired to learn more. That’s one of the reasons I chose to have my genome sequenced and contribute my results to the school to use as a case study for current and future students. I am eager to follow how genomics continues to improve our understanding of health and disease going forward,” says Ms. Pobanz.